You can do almost anything with this so long as you give me credit and don't hold me responsible for any illusions that permission may give you about other users and their content. Please give credit, maybe comment, and link back. 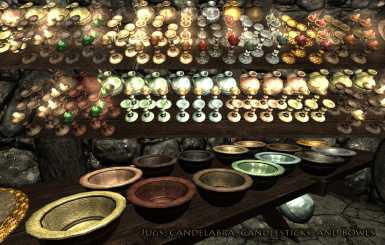 FilterForge.com for the great samples. 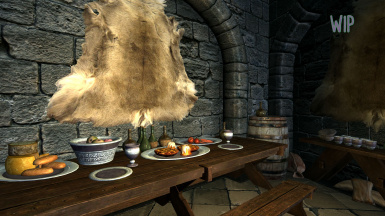 CGTextures for base images and references. Dark Creations Forum for their help and input. 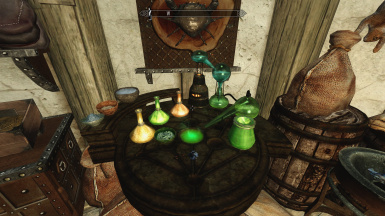 This mod is being poked at for a true conversion to Skyrim SE, and potential expansion. UPDATE: Potentially better ESP found and put up for download. Thank you for the endorsements and the feature! 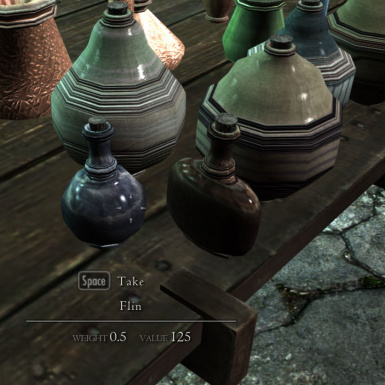 Please let me know how to make this a better mod. Looking for someone willing to take up part of this project, to help me get meshes working and possibly fix my terrible collisions or teach me how. 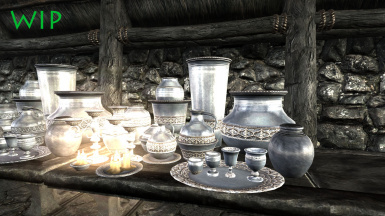 This mod is free for use as a modder's resource. Simply give credit and maybe link back, and you can use whatever you'd like. I'd recommend at least the environment maps. 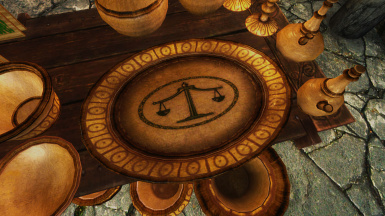 Do you remember Morrowind? No, really... Do you remember it? 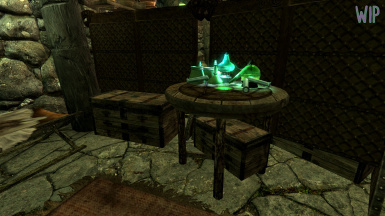 All the furnishings in your nice house you... er... "found"? 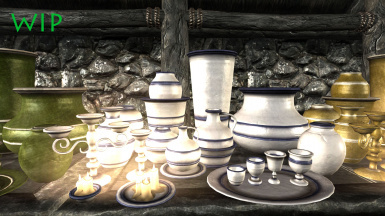 The gleaming glass, local pottery and more importantly rare clutter? Well here's some of it. 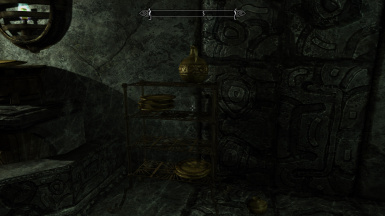 Clutter and loot that can be placed in your home, dungeon or COBL type mod. 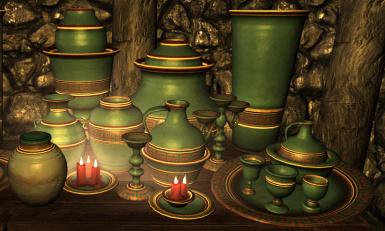 Morrowind is only the start, with many new sets from all around Tamriel included, like Gold (2 variations), Gilded Silver (3 variations), Steel, Bronze, Brass, Iron, Akaviiri (glazed,3 variations), Redguard (gem mosaic inlay, 4 variations), Nordic (4 variations), glazed (5 variations), Cyrodiilic (5 variations), Redware, Clay, Glass (four variations with three sub-variations each), Limeware (2 variations), Dwemer (2 styles, hybrid MW/Reach Dwemer - vanilla Skyrim "Dwarven" ), Dunmer (3 styles, Temple - Hlaalu - Redoran), College, Rusty Iron, and Tarnished Silver. 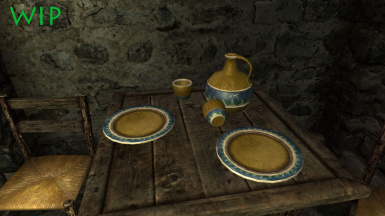 As a bonus, you can drink to your youth, and days come and gone (yada yada) with the local brews from Morrowind as well as the two main imports from Cyrodiil, not to mention the various clutter only bottles that got used as wine and etc in those old hunger mods. Then clean up the carnage afterward with folded cloths and rags. 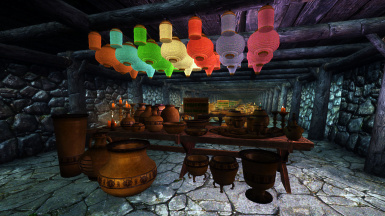 Also included are a decent few lanterns, and some hooks to hang them on. 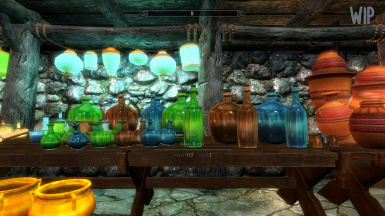 Yes, now you can make Skyrim more of a home. 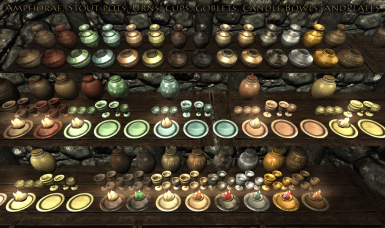 Oblivion tried with its putty-like silver and pottery, but so few objects does not a country's worth of diversity make. 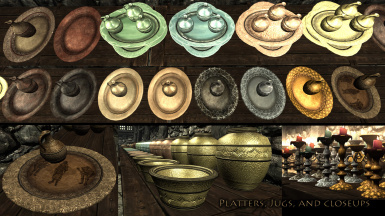 The actual pieces are: Bowls (tall, medium, and soup), Cups (tall, plain and tea), Goblets (three models), Planters (tall, stout, and footed), Platters, Plates, Dishes, Pitchers/Jugs (pitcher, small, large), Pots/Urns (plain, stout, container/burial urn) Fireplace pots, Pots with metal feet (two models), Candles (plates, bowls, two sticks, and a candelabrum), Amphorae, Skooma Pipes (two models), Kettles, Inkwells, Lanterns of all colors, Lantern hooks, Rags, Bottles (14/7 models corked and uncorked, including ring jugs and wine-ish bottles), Ornate bottles,and Teapots. 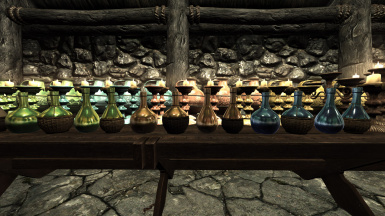 Potions include Flin, Shein, Sujamma, Mazte, and Cyrodillic Brandy. 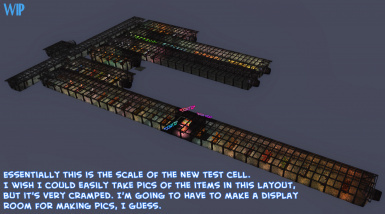 None of these are placed in any location or containers other than the the test cell, so while you can play with this file, you must go there and take what you want for now. Just install this like any other mod to check it out. 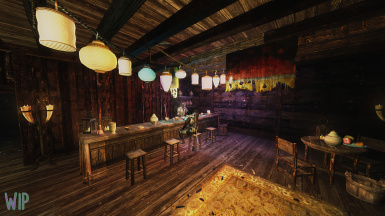 As this is a modder's resource and my newest file was still in progress, there may be typos and other errors. The textures and models are of primary concern. 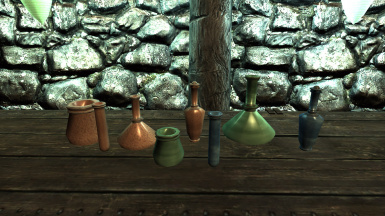 Note to modders: The textures in this were made to fit a common texture type in skyrim. 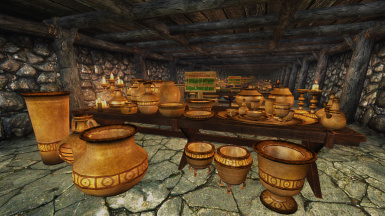 What this means is that you can put them on the braziers in Whiterun for example, and some of the dwarven meshes also use the same coordinates, or similar enough. Experiment with them, and also experiment with Nifskope's UV Map tool. 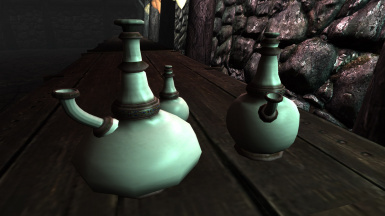 It's clunky, but I got some stuff that was almost right to look /just/ right instead, like the inkwells. 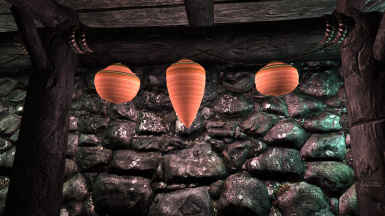 You'll really have to be patient experimenting though, especially if you want to change the color/shade of vertices on things like that and candles. 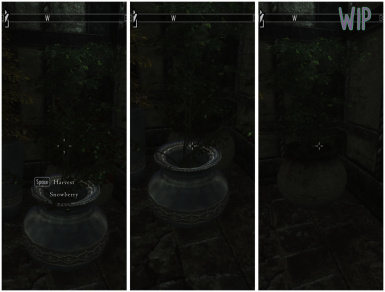 I may make a full fledged tutorial for using this mod to the fullest, and making certain constructions with it.